Bariatric Mattresses for Users Weighing 400+ Lbs. NewLeaf Home Medical offers a complete collection of home care and hospital medical mattresses to accommodate virtually any pressure relief or pressure prevention need. From Alternating Pressure "Medical Air" mattresses and Foam Pressure Redistribution mattresses to prevent pressure ulcers, also known as "bed sores," to comfortable Innerspring and Fiber Mattresses and Mattress Overlays for users who are not at high risk of developing pressure ulcers, you will find the best pressure mattresses from the top medical brands here at NewLeaf—And at affordable prices. An unfortunate side effect of extended bed rest—whether temporary or in circumstances in which a person may be bed ridden—is the increased risk of developing Pressure Ulcers, also referred to as “bed sores.” Pressure ulcers are injuries to the skin and underlying tissue that can be caused by prolonged or unequalized pressure caused by weight of the body pressing the skin against a surface to the point where it slows or stops the flow of blood in the area. Pressure ulcers can also be caused by friction or shear over the skin, especially in areas where the skin is thinnest, as well as exposure to moisture. Bed sores can develop anywhere on the skin, but most often bony areas of the body, such as the heels, ankles, hips, tailbone, back of head, back and shoulder blades. Who is at risk for developing bedsores or pressure ulcers? Patients at risk for bedsores are those who may be confined to a bed for an extended period of time, use a wheelchair, have moist skin from fever or perspiration, those who may suffer from skin breakdown due to dehydration or renal failure, and those who suffer from incontinence or decreased nutritional intake. People who may be immobile or have limited ability to move are especially susceptible to developing pressure ulcers. 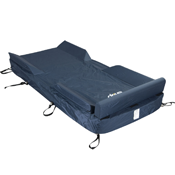 Alternating Pressure Mattresses offer the highest level of pressure prevention among home care/hospital mattresses. While you can learn more detailed information about their wide range of functions here, the simple explanation is that alternating pressure mattresses use a powered system of alternating air cells to redistribute pressure across the sleep surface. 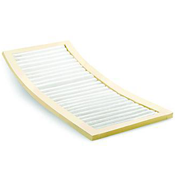 Models with a “Low Air Loss” feature additionally provide moisture and temperate management. 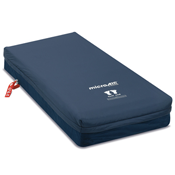 Alternating pressure mattresses are generally recommended to aid in the prevention and treatment of Stage I (mild) to IV (worst) pressure ulcers. This support surface is designed to be placed directly on the existing bed frame surface, and are typically 36” wide and 80” long to 10” high. Some models are available in widths of 42” to 48”. Foam Pressure Redistribution Mattresses come in a variety of materials and design configurations, but are all similar in the fact that they specialize in a non-powered (compared to alternating air pressure) method of redistributing pressure across the sleep surface. 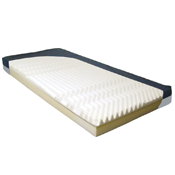 Typically featuring “therapeutic zone” configurations targeting specific parts of the body and multi-layered technology, these mattresses are budget-friendly and suitable for pressure prevention. This support surface is designed to be placed directly on the existing bed frame surface, and are typically 36” wide and 80” long to 6” high. Innerspring and Fiber Mattresses are an affordable, standard quality mattress option. Comfortable, light weight, typically non-allergenic, easily cleaned and water-resistant. They are not suitable for pressure prevention and should not be used in cases where the user spends an above average amount of time in bed, is bed ridden, or is at risk of developing pressure ulcers. 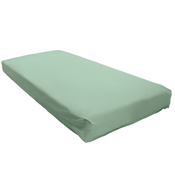 This support surface is designed to be placed directly on the existing bed frame surface, and are typically 36” wide and 80” long to 6” in height. Mattress Overlays can be powered and non-powered, and come in a variety of materials from air mattresses and foam with gel to memory foam. While some models can provide more than basic pressure reduction benefits, they are not generally used for treatment of existing pressure ulcers. 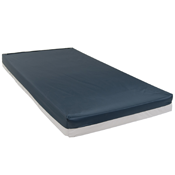 This support surface is designed to be placed directly on top of an existing sleep surface, and are typically 36” wide and 80” long to 2.5” to 5” high. The best form of treatment for pressure ulcers is to prevent them from happening in the first place. And an effective pressure prevention program begins with selecting the right mattress for your situation. As always, be sure to consult with your doctor or other medically trained pressure prevention specialist for the most appropriate guidance based on your specific needs.